Do you give tours or have open farm days? 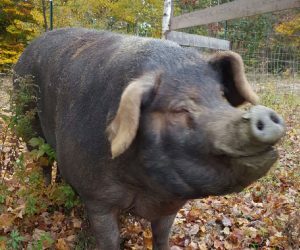 We are currently limiting access to the farm and our resident animals while we finish fences and get systems (staff) in place to share the farm in a way that is most enjoyable and educational for the people and not disruptive or stressful for the animals. Like and follow us on Facebook to find out when our next open farm day will be. Do you use the animals you have in your Care Farm program? We do not “use” the animals at Graze in Peace in any way. Our Care Farm programs are set up with curriculums of selective farm-based educational and personally-fulfilling activities that are located for the most part away from the animals. Some groups who are physically capable, are invited to help with regular volunteer activities such as washing food and water buckets or mucking stall. Others will plant gardens, clear trails or work on projects that benefit the animals and provide a sense of accomplishment for the people. Some people are invited to brush Coal (one of the most socially-demanding creatures on the planet), make artwork for display in the yurt, or just sit and socialize with the turkeys or other animals that want to be with people. All Care Farm activities are supervised by trained staff from Graze as well as accompanying staff from the visiting organizations. If you have any concerns, come volunteer to assist us on a Care Farm day. See for yourself how disadvantaged people from unfortunate circumstances can come here and feel loved, accepted, useful, and pure joy. Homeless teenagers who won’t talk to their counselors, walking and talking to Coal, the sheep. Developmentally-disabled people sharing vegan chicken tacos after mucking a stall and then head-back belly-laughing as they watch our mud-covered pigs, Strawberry and Lucky, race across their field to get their backs and bellies scratched. Graze in Peace was just given a donation to be used to purchase a large animal emergency rescue slide. This takes a great deal of stress off of our minds! Last summer we experienced a situation in which we really could have used this piece of emergency equipment to help get Henry up and off to a hospital where he could receive proper diagnostic and emergency care. Luckily, with lots of around the clock TLC and meds here, all turned out well. At the beginning of this year, we asked the Gus Hawthorne Foundation for help in purchasing this life-saving device and they came through with no questions and a check for the full amount! Words are not enough to express how grateful we are to them for caring about animals as much as we do and for giving us the means to continue to care for them when they are at their most vulnerable. Thank you, Gus Hawthorne Foundation, and thank you to all our supporters who help us help these precious beings here every day.